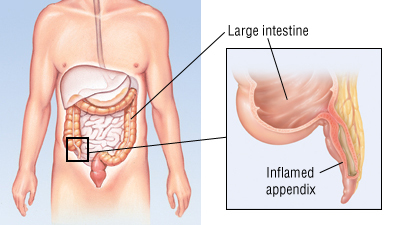 Appendicitis is an inflammation of the appendix, a small, fingerlike tube that hangs from the lower right side of the large intestine. The purpose of the appendix is not known. It usually becomes inflamed because of an infection or an obstruction in the digestive tract. If untreated, an infected appendix can burst and spread the infection throughout the abdominal cavity and into the bloodstream. Appendicitis affects 1 in every 500 people in the each year. The risk of appendicitis increases with age, peaking between ages 15 and 30. Appendicitis is the main reason for abdominal surgery in children, with four of every 1,000 children needing the appendix removed before age 14.